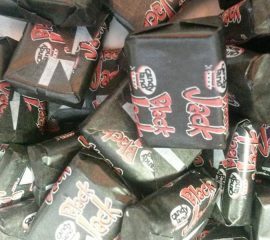 When you just can't decide what to get this is the perfect choice - a couple of traditional, a few jellies and gums and a little bit of chocolate too! You can't go wrong with a bit of everything... 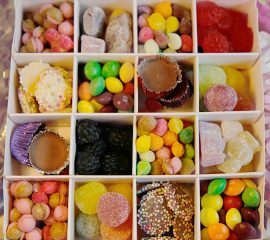 This selection includes: Cola Pips Fruit Pips Jelly Babies Black & Red Gums USA Hard Gums Skittles Jazzies Snowies Icy Cups Each box is approximately 16cm x 16cm x 4cm At times we may be out of stock of a particular sweet (not often), when this is the case we will include a suitable substitute of the same of greater taste & quality. Who can resist spelling their name or making up words with these before they eat them?! Why not challenge your friends to make the most words? Or better still eat them! 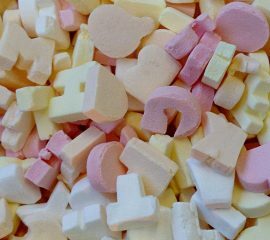 These candy sweets are in a variety of pastel colours and shaped into alphabet letters...just a little fun to go with your sweet! 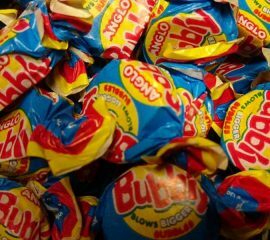 If you remember Anglo Bubbly then we know you had an ace childhood blowing bubbles and seeing who's was the biggest - well here's your chance to do it all over again! From the minute you open the bag you'll smell the fruitiness and we promise the fruity taste won't disappoint either! 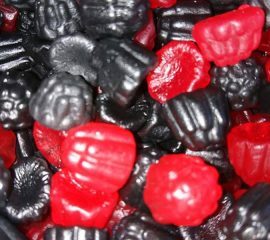 Lets admit it we all love the red and black flavours the best! Well here you go purely black and red gums so you don't have to pick the other colours out! 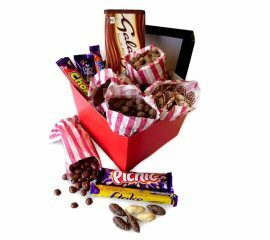 A whole box full of chocolatey delights...this hamper contains it all - chocolate bars, raisins, nuts, fudge...we could go on but you'll see it all in the contents list so all we'll say is if you know a chocolate fan then this hamper's for you! 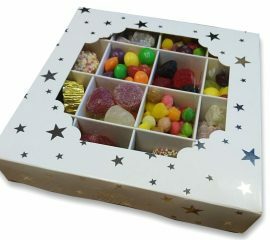 This hamper box measures 17.5cm x 17.5cm x 15cm and is finished off with a bow - making a perfect gift! This hamper contains: 1 x Galaxy Block 100g x Milk Chocolate Covered Raisin 100g x Milk Chocolate Covered Peanuts 100g Chocolate Flavoured Fudge 1 x Picnic 1 x Flake 100g x White & Brown Chocolate Mice mix 100g x Jazzie & Snowie Mix 100g x Chewing Nuts 1 x Freddo 1 x Chomp Bar 1 x Fudge Bar 1 x Dairy Milk Little Bar 100g x Toffee Crumble At time we may be out of stock of a particular sweet (not often), when this is the case we will include a suitable substitute of the same great taste and quality! No need to scream - this is a mouse you'll love! 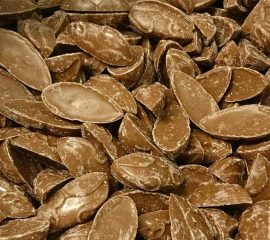 It may be chocolate flavoured but its taste just like chocolate to us, and mighty tasty...why not try the white variety too? 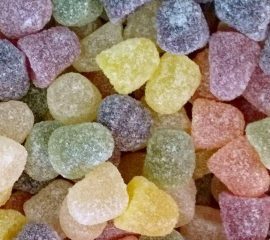 Do you know what a dew drop is...well its a small dome shaped fruity jelly with a sugar coating...also known as the jelly sweet you get in the dolly mixtures! Soooo if you don't fancy all the other bits in the dolly mix but you what the jelly then you need a bag of dew drops! A classic favourite especially for children and those young at heart! 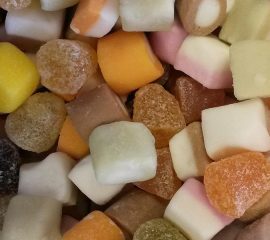 With a delightful mix of flavours and textures nothing quite compares to a dolly mix!